If someone handed me several thousand dollars and told me that I must spend it all on one Disney trip (sadly, this has never happened), I imagine I would choose to stay at The Polynesian Village Resort, one of Disney’s Deluxe Resorts. The ambiance is detailed and beautiful, it’s the closest I’ll get to a Hawaiian vacation anytime soon, the pools are considered to be some of the best at Disney, and being on the monorail line is a really nice plus when staying at Disney. However, since The Polynesian costs $500 per night (and up), we won’t be staying there anytime soon. 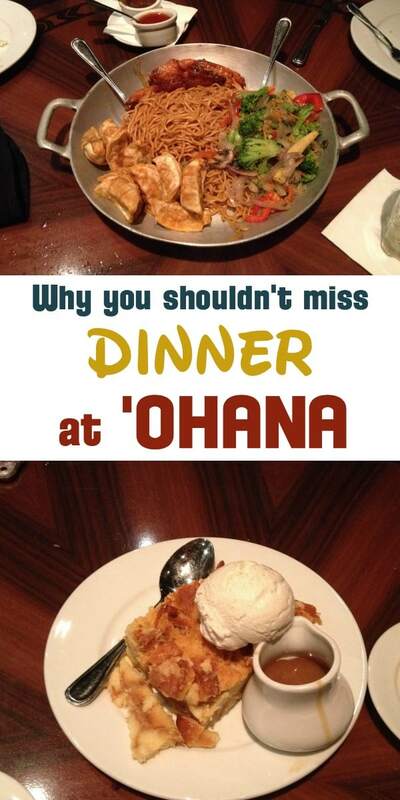 Instead, we have to simply “settle” for dinner at ‘Ohana and enjoy the atmosphere for a single evening. Which, as you’ll see, is not a bad thing at all. ‘Ohana (which means “family) is a family-style table service restaurant. 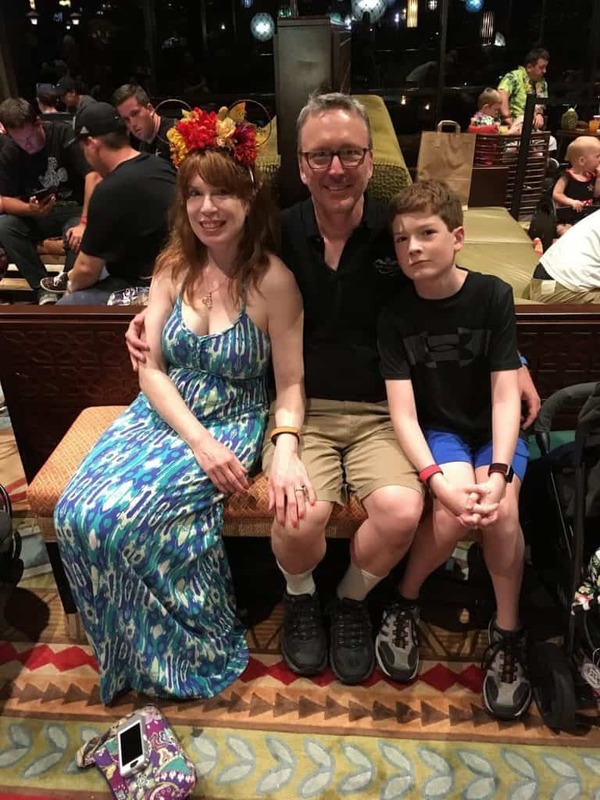 While they offer a breakfast character meal with Lilo, Stitch, Pluto, and Mickey Mouse (they do not serve lunch), this review will focus on our family’s recent experience, which was for dinner. 1 Is Ohana a buffet? 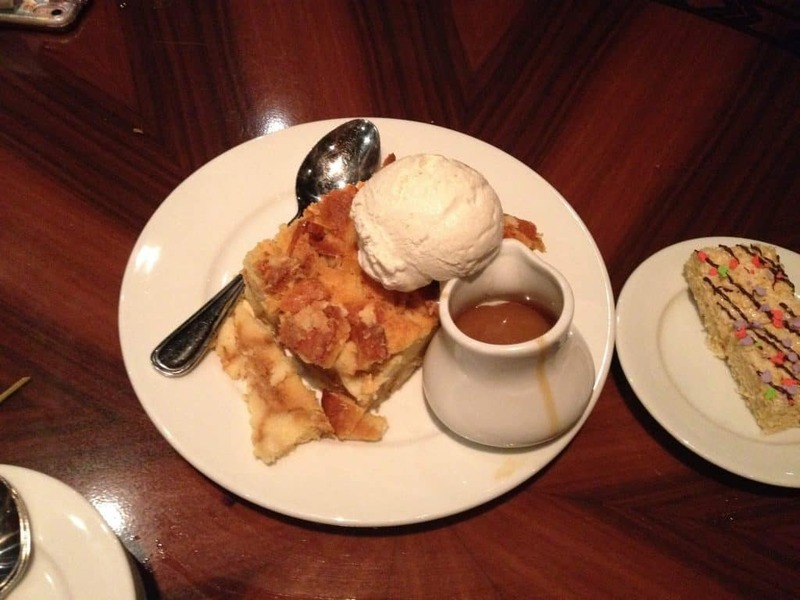 5 Where Else Can I Get ‘Ohana Bread Pudding? 9 How Long is Dinner at ‘Ohana? 10 Can I Watch the Fireworks from ‘Ohana? I have also heard that ‘Ohana has Coconut Races, but either we missed that or just didn’t notice it. I was slightly apprehensive beforehand because I had read reviews describing ‘Ohana as “loud” and “chaotic,” and I was afraid it might be a little like a Hawaiian version of Chef Mickey’s. However, while I would describe it as “having a fun atmosphere,” I didn’t find it particularly noisy. Of course, that could be because we there at 8:00pm. However, if you want to have some fun, you might want to wear something Hawaiian-themed. 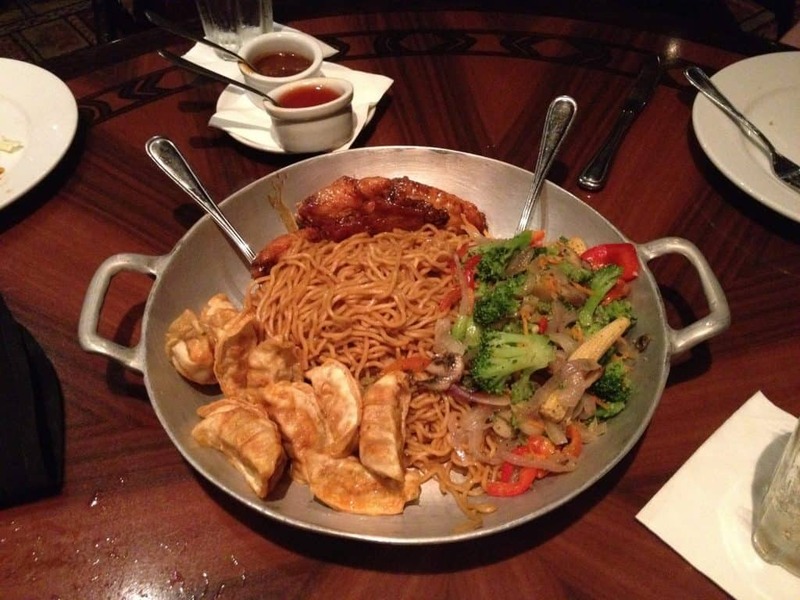 The important thing to remember when eating at ‘Ohana is that you have to pace yourself. My kids were disappointed that they had filled up too much on noodles and bread (although both were delicious), and Rob’s favorite part of the entire meal was the shrimp, which unfortunately for him was the very last thing served before dessert, so he couldn’t fill up on it as much as he would have liked. Now at this point you honestly could say that you had a full, delicious meal … but guess what? That was just the warm-up. Now it’s time for the “main course,” which is skewers of Szechuan Sirloin Steak, Sweet-n-Sour Chicken, and Spicy Grilled Peel-n-Eat Shrimp, grilled over an oak fire in the middle of your restaurant and brought to your table one at a time. Peanut sauce and sweet and sour sauce is provided for dipping. It’s a lot of food. Consider yourself warned. ‘Ohana’s bread pudding is sort of considered the star of the show — or at least the part of the meal that gets the most buzz, by far. It was quite amazing, as anything involving the words “ice cream,” “caramel,” and “bananas” is obviously going to be. Since Benjamin is 12 years old, he got the “kids’ dessert” of a Rice Krispie Bar decorated with candy. Interestingly, he was happy to have that instead of the Bread Pudding. Those crazy kids. Where Else Can I Get ‘Ohana Bread Pudding? If you want to dig into this bread pudding but can’t, or don’t want to, have a full-blown dinner at ‘Ohana for whatever reason, you have a few options. The easiest is to go to the Tambu Lounge connected with ‘Ohana and order a single serving of bread pudding to enjoy right in the lounge. 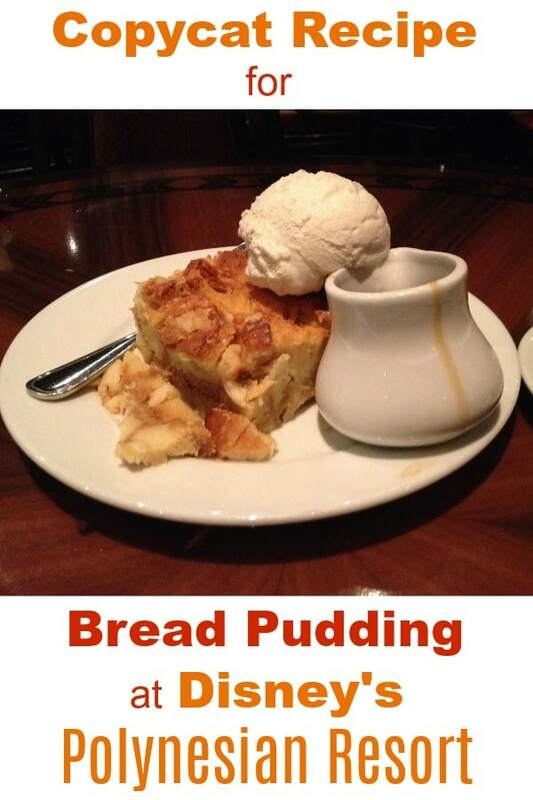 Also, I have heard many times that if you are eating at Kona Cafe (also at the Polynesian, and which we’ll discuss more in a moment), you can order the ‘Ohana Bread Pudding there, even though it’s not listed on the menu. And if you’re lucky enough to be staying at the Polynesian Village Resort, you can order the bread pudding at any time via room service. ‘Ohana offers several alcoholic specialty drinks. I ordered the Tropical Macaw, which is made with Coruba Coconut Rum, Melon Liqueur, Pineapple Juice, and Cranberry Juice. 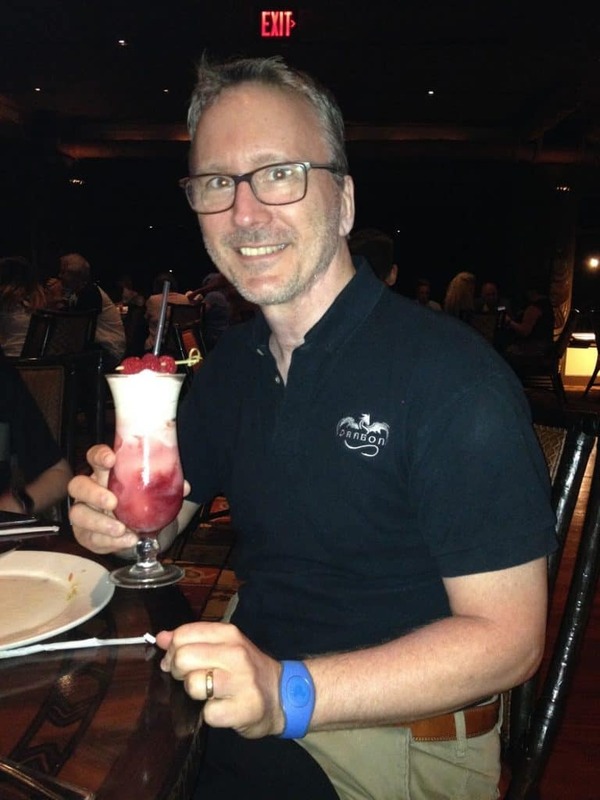 I believe Rob had a Pina Colada. Dinner is $46 per person, and the price for children ages 3-9 is $26. Was it worth the hefty price tag? Your mileage might vary, but I would say yes. How Long is Dinner at ‘Ohana? People often want to know how to time their ‘Ohana dinner with getting back in time for an evening FastPasss reservation at the Magic Kingdom. In a sense we were lucky, because the only reservation we could get was at 8:00pm, which made “getting back to the park” a non-issue. I would personally recommend not trying to squeeze in a FastPass after ‘Ohana. First of all, a big part of ‘Ohana is the “experience,” so you want to enjoy it and not get stressed out (as I would be) checking your watch every few minutes and worrying if you’re going to be late. Second, things like that always take longer than you think they will (or at least they do in my world). Paying the bill will take longer than it should have. The monorail will run late. It will take you longer to get back to the park than you estimated. Someone will need to go to the bathroom. It makes me feel stressed out just thinking about it! A third point that’s worth mentioning is that after eating at ‘Ohana, you’ll probably be so full that you can barely move, let alone want to go sprinting through Tomorrowland to go ride Space Mountain. But to answer the question — I would say to allow 75-90 minutes for the actual meal, plus an additional 15-20 minutes to get seated. Can I Watch the Fireworks from ‘Ohana? Since The Polynesian is literally walking distance from the Magic Kingdom, it makes sense to assume that it’s a great place to watch Wishes, the nighttime fireworks show. While that can work, the reality is a little different. You may very well not be able to get a window seat — and if you can, you may not be thrilled to have many new “family” members appear at your table. While we have never tried this ourselves, I’ve heard that a better idea is to head to the Polynesian Beach (particularly an area called Sunset Point) after dinner to view the fireworks. Finally, the question often pops up as to which is better, ‘Ohana or Kona Cafe, which is another table service restaurant at the Polynesian. In fact, we originally had reservation for Kona Cafe and I ended up changing it to ‘Ohana just a couple weeks before our trip. 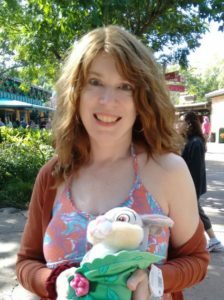 I’ve been to both (although never for breakfast), and while I was very impressed with our meal at Kona Cafe, I would recommend ‘Ohana if you’re trying to decide between one of the other. 3) You don’t like the idea of a ton of food. The food [at ‘Ohana] really appeals to us and it is all you care to eat. There are also some greater benefits I think with a 2 year old. As I’m sure you know, eating out with a toddler isn’t always easy. Ohana is a much bigger restaurant if you need to take a walk and there are more distractions which may keep him entertained. For starters, there are big windows looking outside if you are lucky enough to get sat close to one and not in the center section. They also have a guy that walks around singing and playing the ukulele as well as occasional activities for the kids such as pushing a coconut around the room with a broom. The one thing that concerns me and keeps me from booking an ADR at Ohana (even though I REALLY want to try the dinner there!) is that what the adults get, the kids get. There’s no kid’s menu. And if you have a picky kid (like I do), you’ll be paying for a meal that isn’t eaten and leaving with a child you still need to feed. That can get really pricey really quickly when the child is 10, so you’re forced to pay the adult price. 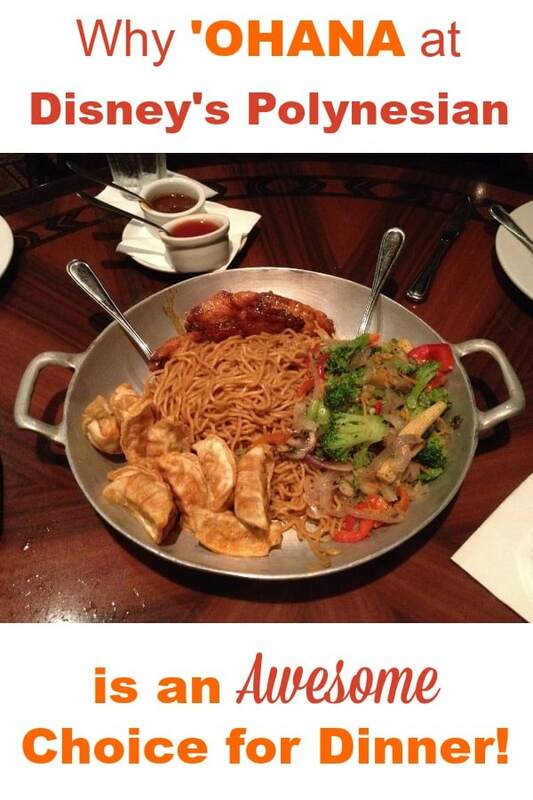 Ohana needs a kid’s menu!!! PegP, I would encourage you to try Ohana. There are so many options (and one of them is noodles!) that is seems like there is something your child would like. The meats all come with different dipping sauces, so if your child is a “dipper,” that could help. Also, you can get as much of any food as you like, so even if your child eats nothing but the dumplings, they can eat a ton of them. I didn’t think the food was “weird” or having an unusually strong or spicy flavor. And my kids are older now, but I don’t remember there being anything on the menu that anyone said they didn’t like.